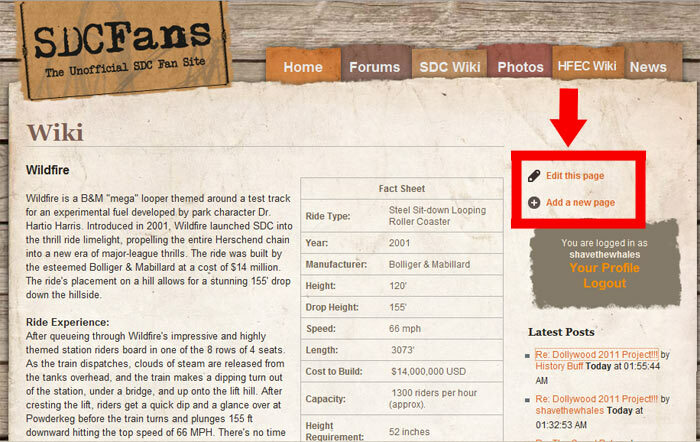 One of our major new features is what I'm calling the 'wiki' system. Anyone with a forum account can now go onto the main site and suggest updates to our content pages, as well as submitting news stories and events. Unfortunately, editing our content can be a bit clunky at time, as some of our pages use a bit of HTML and in-line CSS to achieve certain formats. However, one does not need to concern themselves with these issues unless they really want to. If formatting is a problem, just leave it to me. I will be screening all changes before they are made live on the site, so I do all the necessary presentation fixes. What I really want and need is help building up a comprehensive database on all things SDC. If we put our heads together on this, we could produce the most comprehensive park history ever! With that said, here's a step-by-step of how to use the new system. 1. 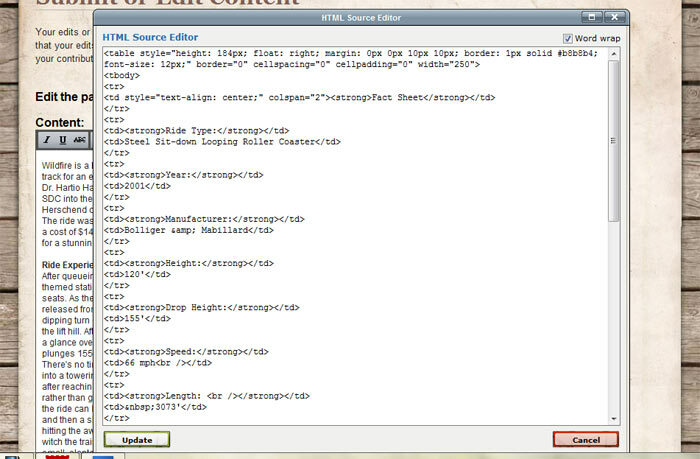 First, notice that on all content pages, there are links on the upper right side of the page that say things like 'Edit this page' or 'Add a new page'. Click either of these to do just that. 2. You'll see a big content box that looks like this. For the most part, it's like a word document - just type in whatever edits you want to make. I'm still missing a few buttons at the moment for adding pictures and modifying text, but the concept shouldn't be hard to figure out. 3. You'll see this. If you know anything about HTML, then you should be able to make good use of this little feature. If not, don't worry about it. You can always contact me if you have something that requires a bit of coding to make it look right. 4. Finally, there's a comment form at the bottom. Please use this to let me know what you've changed. It will make it much easier for me to approve your changes on a timely basis. That's the system for now. This is only the beginning. 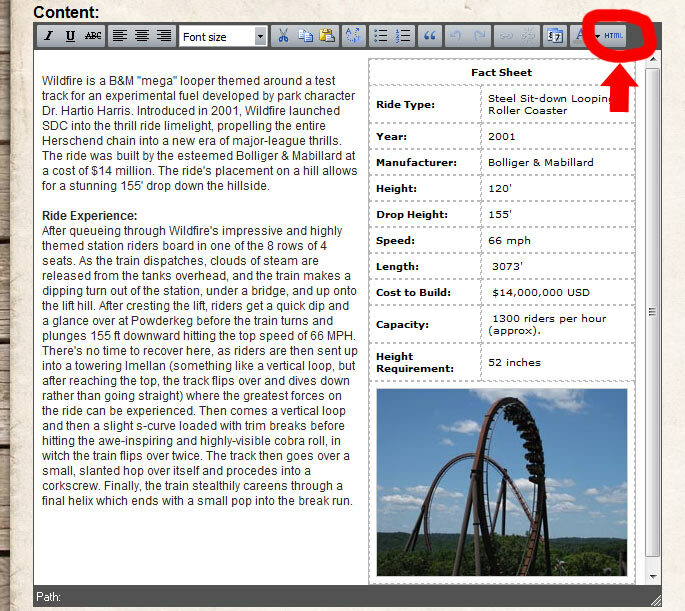 Further improvements will include revision histories, talk pages, and the ability to link in galleries for certain pages such as for rides. Notice that I'm trying to move our pages toward a wiki style with tabular data and clear sections. Much of our content was written several years ago back when this site was more or less a little personal review site of mine, so this is a big effort. Any help would be appreciated. There are also countless pages that would be great to add, such as for the park's characters, notable employees, ect. I'll be working on content a lot this year instead of re-doing the site for the 16th time, so feel free to pitch in if you know anything! you guys are doing great! thanks again for the assist on the Eagles Lodge ad.! Does the wiki link for "food" work for anyone else? I'd be willing to add some basic info on the different food options, but the link doesn't appear to work for me. Is it just me? I'm able to view park history and rides with no problems. Thanks! awesome cant wait to see the collective smarts of this group! The food pages are offline right now (and have been for a while unfortunately ). They keep changing the food options so much that what I had written was very outdated, and I haven't had time to get any new articles started yet. I'll try to get those pages opened up soon for you if you want to add some info. Thanks! btw, I haven't had much time to clean up the wiki features yet, so they're still pretty clunky. However, nothing anyone writes goes onto the site before I review and edit it, so if you want to just throw in some notes or whatever I will see it and be able to edit it in properly. Also, if you can't figure something out like adding photos or formatting, just write a note and I can take care of it. I should have a cleaned up version of the wiki system ready when the next version of the site goes live in a few weeks. Awesome, looking forward to it. I don't have the personal experience with the history of the park that some here have, but I do know the food pretty well and was willing to add to the wiki if it would be helpful. Thanks!